The ‘acute abdomen’ is defined as a sudden onset of severe abdominal pain of less than 24 hours duration. It has a large number of possible causes and so a structured approach is required. The initial assessment should attempt to determine if the patient has an acute surgical problem that requires immediate and prompt surgical intervention, or urgent medical therapy. The first decision when you first see any patient is “Are they critically unwell?”. A 10-second assessment of their clinical state can be made by a general look (the “end-of-bed-o-gram”), their observations, and whether they can talk to you. If they are critically unwell, give oxygen, start suitable initial steps, and call for help early before going into detail on the history and examination. 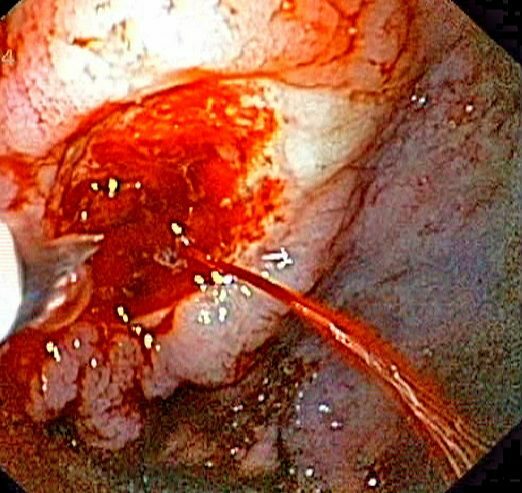 Figure 1 – Endoscopic image of a bleeding gastric ulcer. This requires urgent surgical intervention. The most serious cause of intra-abdominal bleeding is a ruptured abdominal aortic aneurysm, which requires swift referral to the vascular team and immediate surgical intervention. Other common causes usually involve a slower rate of bleeding, but with urgent surgery still required, include ruptured ectopic pregnancy, bleeding gastric ulcer, and trauma. These patients will typically go into hypovolemic shock. Clinical features include tachycardia and hypotension, pale and clammy on inspection, and cool to touch with a thread pulse. Peritonitis is the inflammation of the peritoneum, and a generalised peritonitis is most commonly caused by perforation of an abdominal viscus. The causes of perforation are broad but include peptic ulceration, small or large bowel obstruction, diverticular disease, and inflammatory bowel disease. This is especially important when compared to a renal colic, whereby patients are constantly moving and cannot get comfortable. Any patient who has severe pain out of proportion to the clinical signs has ischaemic bowel until proven otherwise. They are often acidaemic with a raised lactate and physiologically compromised. Patients will often complain of a diffuse and constant pain, however the examination can often otherwise be unremarkable. Definitive diagnosis is via a CT scan with IV contrast, with early surgical involvement. Ischaemic bowel is discussed in more detail here. Colic is an abdominal pain that crescendos to become very severe and then goes away completely. This is most typically seen in either ureteric obstruction or bowel obstruction. Biliary ‘colic’ is not a true colic as the pain does not go away completely, instead getting periodically better and worse (colloquially termed ‘waxes and wanes’). Peritonism (not peritonitis) refers to the localised inflammation of the peritoneum, usually due to inflammation of a viscus that then irritates the visceral (and subsequently, parietal) peritoneum. This leads to patients stating that their abdominal pain starts in one place (irritation of the visceral peritoneum) before localising to another area* (irritation of the parietal peritoneum) or becoming generalised. The location of abdominal pain is perhaps the most useful initial feature to help narrow your differential. These can be classified based upon quadrant or region affected, as shown in Fig 2. 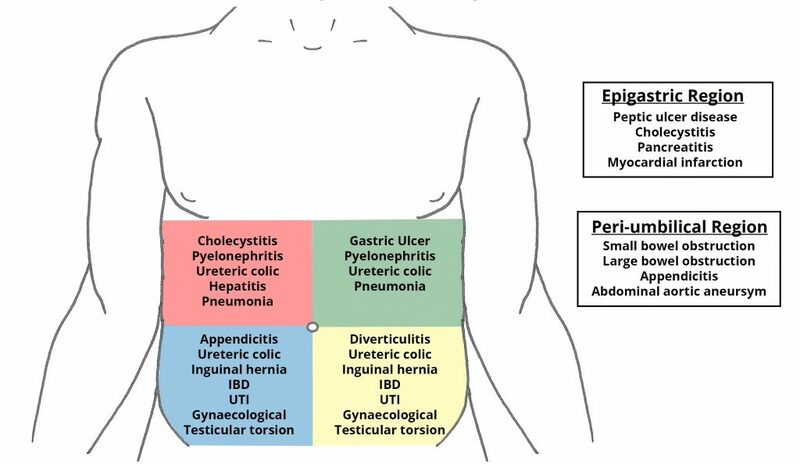 Figure 2 – Differential diagnoses for pain felt in the different regions of the abdomen. Urine dipstick – for signs of infection or haematuria ±MC&S. Include a pregnancy test for all women of reproductive age. ABG – useful in bleeding or septic patients, especially for the pH, pO2, pCO2, and lactate for signs of tissue hypoperfusion, as well as a rapid haemoglobin. Routine bloods – FBC, U&Es, Liver Function, CRP, amylase. Consider measuring serum calcium in suspected pancreatitis. Do not forget a group & save (G&S) if the patient is likely to need surgery soon. 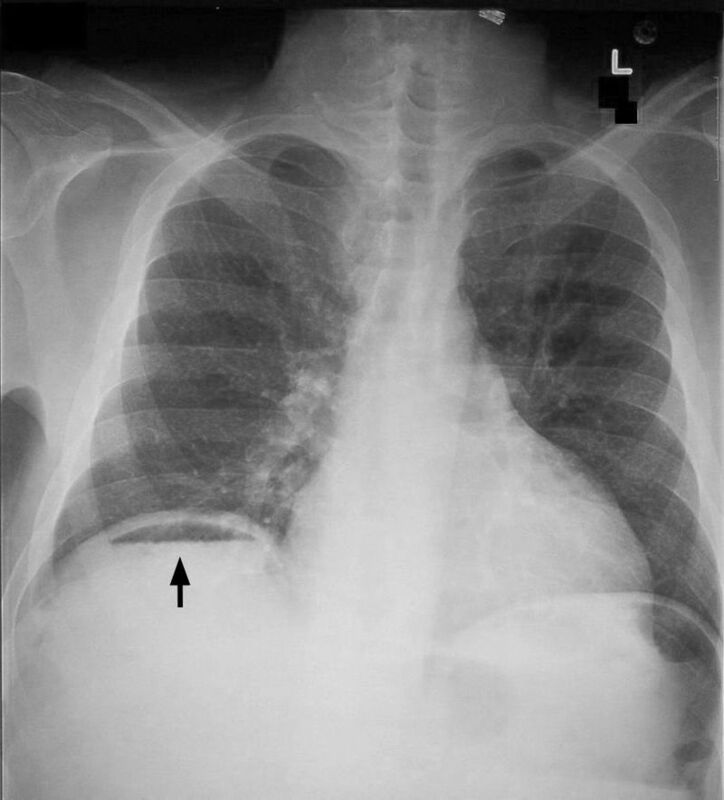 Figure 3 – An erect chest radiograph, showing free air under the right diaphragm (pneumoperitoneum); this strongly suggests bowel perforation, but can also be seen in post-laparotomy patients. In the emergency setting, every patient with abdominal pain should have an ECG to exclude myocardial infarction. The definitive management of acute abdomen depends largely on the cause. However, a good initial management plan includes the same key points – regardless of the underlying aetiology. These include admission, IV access, NBM, analgesia +/- antiemetics, imaging (as discussed above), VTE prophylaxis, urine dip, bloods (as discussed above). Consider a urinary catheter and/or nasogastric tube if necessary. Start IV fluids and monitor fluid balance. Which one of the following scenarios best describes parietal peritoneal type of abdominal pain? A 24 year old woman presents with acute right lower quadrant pain. Which of the following pathologies must be included in your differential? Which of the following radiological signs does not suggest a surgical abdomen? Which of the following best describes biliary colic?